Seeing happy couples on a Jumbtron’s kiss cam is one of the fun diversions fans have come to expect at sporting events. Tourist visits to Times Square in New York City almost always include taking photos with Sony’s Jumbotron in the background. Even the outdoor LED screen in your hometown that provides time and temperature information is an important part of your everyday life. The uses of LED screens are numerous, but they are often a major initial investment, not to mention ongoing maintenance costs including cleaning. Dirt, grime and dust all build up on LED screens, negatively affecting picture quality. When a business puts a message in lights, those lights need to shine brightly. The Grime Stoppers can help reduce maintenance costs of LED screens with our new product, PURETi—a safe, sustainable, light-activated product that not only reduces maintenance costs, but also transforms the LED screens of the world into self-cleaning, air purifying marvels. 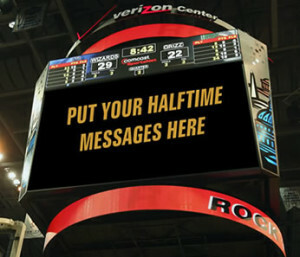 PURETi helps ensure that the intended big and bright impact of an outdoor LED screen is realized. PURETi-treated surfaces need to be cleaned half as often and cleaning is twice as easy as untreated surfaces. The environmental impact is substantial, reducing the required water, energy and chemicals used to clean by half. When cleaning is easier, it’s also quicker, so labor costs are reduced as well. PURETi also helps maintain high-end picture quality by actually preventing the build-up of dirt, grime and dust. The coating interacts with the microscopic airborne particles would otherwise equal an image-blocking layer of gunk. PURETi actually oxidizes particulate matter, so LED signs keep shining brightly. An additional benefit is that PURETi also eliminates VOCs (volatile organic compounds) and harmful greenhouse gases. A PURETi-coated outdoor LED screen works for you and works for the environment. One application of PURETi lasts for up to three years, providing full benefits the entire time. The cost of application is extremely affordable and is easily offset by the significant savings on maintenance costs. Side-by-side images of PURETi- treated and untreated surfaces after three years show that an untreated surface is like looking through a very thick, gray fog. It’s definitely not the way you intend your promotional message to be seen. The trained and certified application technicians with The Grime Stoppers use specialized spray equipment to deposit a very thin film that dries in seconds and cures in hours to form an invisible polymeric film that is durably bonded to the treated surface. PURETi holds an SCS Global Services certification, which makes it an Environmentally Preferable Product and point worthy in the LEED program of the U.S. Green Building Council. That certification is more than just a pat on the back. It’s an important detail for new construction when seeking tax credits. If you would like to learn more about the benefits of PURETi for your LED screen, contact The Grime Stoppers today.